Well good morning and Happy Thursday! Well it looks like Spring or should I say Summer is finally making her appearance here in Central New York.We were seriously beginning to think she decided to vacation in the tropics and we were going to have to skip over it straight to Fall...our temps have been hanging in the 40's and 50's which is quite chilly even for us this time of year...but in CNY fashion, she is fashionably late and hit 88 today! Now, if it just sticks! What's the weather been like in your area? 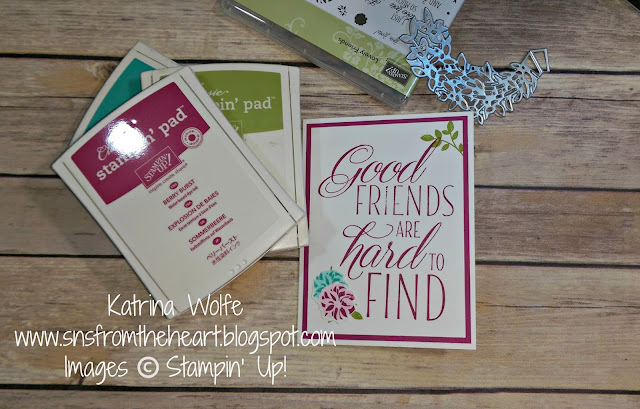 Ok, well enough about the weather here in CNY, I have a pop up card for you using the brand new Lovely Friends stamp set and Lovely Laurel Thinlits. This set is just too cute and has so many possibilities. I just love the new In-color Berry Burst. It's just so bright and cheery and it coordinates well with several of our core colors. Here I paired it up with Bermuda Bay and Old Olive and I think it just pops with these colors.